Lock in a great price for Hotel Dos Ceibas Eco Retreat - rated 8.4 by recent guests. Nice and quiet at the end of the beach - no noisy clubs/hotels next to it. Very very friendly team in the service. Great yoga and massages with ocean view. Cozy and beautiful at the same time. Amazing place! Great staff, perfect location, peaceful and beautiful beach, delicious restaurant and the most fun kitesurf school ever! Will definetly return. The staff was very friendly and welcoming. The property is beautiful and well maintained. The room was clean and had a great view of the ocean. The layout of the property (rooms, restaurant, bar, seating) was well planned. We only ate at the restaurant for breakfast, but it was fresh and delicious. The setting is paradise. All on the beach with a beautiful sand path to the beach. 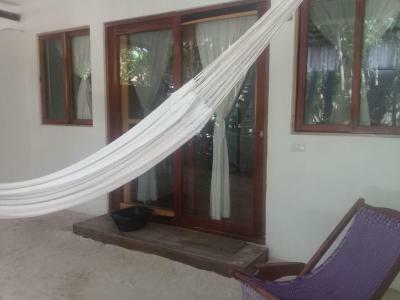 The room was great with hammock outside and very clean. The food you can order from beach was good. We had a fabulous time at Dos Ceibas. The beach is incredible, the resort is small, quaint and quiet. The food and drink is very good in quality and price. We found the staff friendly and helpful. Miguel and Orfay at the front desk, Percival, Jose and all the waiters. The room was fantastic. Big and clean. We felt good inside and on the balcony. The staff was very friendly and helpful. Very nice breakfast included. Everything was fantastic, the rooms were a lot better than they looked in the photos. The surroundings were stunning and the staff so welcoming, fun and friendly. The location was great. Bungalows right on the Beach settled in garden. The view was stunning, the see was beautiful and the beach was very clean with sun beds and umbrellas. They also has kitesurfing school! Wonderful calm beach so close!! Very nice people at the reception! Great big bed! Loved the yoga in the morning. The room with hammock on second level, #1, was great! gorgeous view. Staff were fantastic! 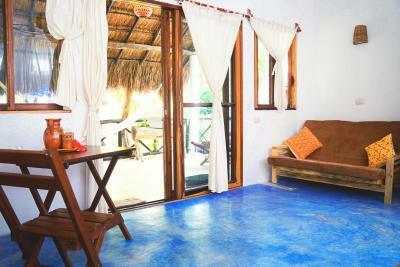 One of our top picks in Tulum.Hotel Dos Ceibas Eco Retreat has a model of sustainable tourism, we are ecological. Set on a private area of Tulum Beach, this eco-resort offers a typical Temazcal sauna, yoga classes and a range of massages. It is located next to the beautiful Sian-Ka'an Biosphere Reserve. The thatched bungalows have fans, bathroom and views of the gardens. The bungalows are powered by solar panels and wind energy. They have traditional décor and come with mosquito nets. Dos Ceibas Posada Ecológica is surrounded by tropical gardens, including 2 Ceiba trees, known as the sacred trees of the ancient Mayas. As an activity, the hotel organizes lessons of sacred dance, meditation and full moon Mayan ceremony. The lobby offers a free WiFi zone and a 24-hour reception. Staff can arrange hiking or diving trips and organize transfers to Cancún Airport, a 90-minute drive away. The Dos Ceibas’s open-air restaurant serves simple, home-cooked food. Continental breakfast is included. Hotel Dos Ceibas Eco Retreat has been welcoming Booking.com guests since 14 Sept 2011. When would you like to stay at Hotel Dos Ceibas Eco Retreat? Located in the gardens, this room includes a seating area, a ceiling fan, mosquito nets and a private bathroom. House rules Hotel Dos Ceibas Eco Retreat takes special requests - add in the next step! Hotel Dos Ceibas Eco Retreat accepts these cards and reserves the right to temporarily hold an amount prior to arrival. Please note the reception is open from 7:30 AM till 10 PM. 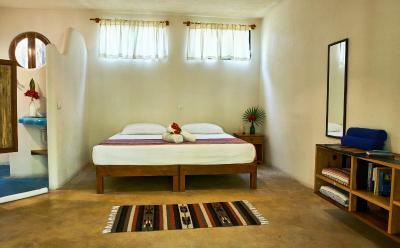 Between the 15th of December and 5th of January the price for the extra bed is 40 USD. Please inform Hotel Dos Ceibas Eco Retreat in advance of your expected arrival time. You can use the Special Requests box when booking, or contact the property directly with the contact details provided in your confirmation. The road in and out of the hotel/beach area is very busy and there's a lot of construction going on which made it frustrating at times. Dos Ceibas was a nice and quiet retreat away from all the goings on. The grounds are very lovely and well kept. Our room was very nice and clean. The accommodations are very simple and perfect for a beach vacation if one doesn't want a fancy resort. I would recommend a garden view or ocean view room. The others were closer to the road and seemed noisier. The food is very good at their restaurant. In fact, we ate several of our dinner meals there as it was nicer and easier than going out to busier restaurants. This area of Tulum is being over run with really high priced hotels and restaurants. It's hard to walk safely on the street, but also hard to find public access to walk on beach instead. Our hotel had one of the few public accesses we found. Fruit was delicous, need to pay more if want a hot breakfast, but it's great too. I loved our room with just what we needed and nothing we didn't. We had one of the rooms closer to the beach which I would highly recommend, because on hot days there was always a breeze! There is a cenote walking distance which was great for cooling off in Fresh water. The staff was so friendly and helpful. The property is so beautiful. Quiet and calm. The water pressure isn’t great and there was a smell of sewers in our room but it is an eco resort. The staff and management are bad and just don’t seem to care, mainly at the beach club. Reception was great and helpful but the beach and restaurant staff really had a negative effect on our stay and this type of thing doesn’t normally bother us. At around 4pm each day they play really loud and awful club music on the beach for a couple of hours. The staff take ages to serve you and don’t seem to care unless you are a paying to use the beach club. The breakfast is only 4 pieces of toast, coffee and 5 chunks of fruit. They just seemed to want to sell us the extra breakfast and if you can’t drink caffeine you have to pay extra for another drink. We never received our welcome drinks despite asking. Hotel Dos Ceibas felt like home. Nestled in the jungle on the edge of the Caribbean awaits a cozy tropical paradise that is not overly fancy (like a lot of hotels in Tulum) and not rustic enough to be categorized as "glamping." My sister and I LOVED the tropical trails that connect the villas to the beach. The food was authentic and delicious and the people on location felt like family. Good vibes, only. Amazing drinks - I recommend the freshly pureed mango margarita - and the best service!! Pura Vida! This place was phenomenal!!! I’m a young, single female and felt welcome, safe, and relaxed at this place. Room #1 is idyllic. The staff gets to know you by name, has tons of recommendations, and the food is delicious. Highly recommend!! We had an excellent stay. Wonderful beach and ocean breezes, very friendly relaxed vibe, very attentive wait staff (we grew especially fond of Jose who was so sweet and accommodating),and a clean, cute and comfortable room. Very happy with the food. We stayed a week and never felt like leaving to try another restaurant. The food was fresh and delicious. Loved the stuffed fish, fish tacos, and guacamole. Really wonderful smoothies too! Bar drinks were top notch. There was a happy lively atmosphere and frequent musical entertainment. We especially enjoyed the live jazz trumpet during a dinnertime. Front desk staff very helpful arranging rides, trips etc. It was interesting and useful as well when they shared their personal experience to help with decision making. The manager, Percival, was so welcoming and energetic, always there when we needed any assist or just a smile and a kind word! All was perfect. We had a room just at the beach with a sandy garden where we could seat and enjoy a view of the ocean and sip our drinks or just lay down on the hammock. At the night time we could hear the ocean. And in the morning we could enjoy sunrises. We had a breakfest included in our rate and it was delicious. Also each day we had a different friut juice and home-made jam. A coffe was also very good, especially with a coconut milk. The room was cleaned up every day. We can only recommend. Don’t change a thing! We will be back. We especially appreciated the Organic and holistic vibe from start to finish. We loved the tranquility and the overall sense of belonging. The entire staff were incredibly kind , patient and warm. The beach was spectacular and were able to swim daily. Also, we really enjoyed our short shoeless walk from our bungalow. Special thank you to Alex ( Alejandro), who always greeted us by our first names. The music and dj during happy hour also added to the great vibe. Loved how the property fit within the jungle and how it was at the end of the hotel strip. Wonderful accommodating staff and service!